Grows plants twice as big (vs. unfed plants). Absorbs 33% more water than ordinary potting soil to prevent over and under watering. 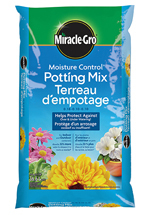 Feeds plants up to 6 months with Miracle-Gro Continuous Release plant food. The number of containers filled varies by bag size. See on back of bag. Use when potting or repotting indoor or outdoor plants in containers. 1. Select a pot with a drain hole. 2. Fill pot about 1/3 full. 3.Loosen root ball, place plant in pot. 4. Add mix, press lightly. Not for in-ground gardening use. Whenever planting new plants or when repotting annually. Select a pot with a drain hole. Fill pot about 1/3 full. Loosen root ball, place plant in pot. Premium potting soil for indoor and outdoor container plants. Grows plants twice as big (versus unfed) and feeds for up to 3 months! For Bigger, More Beautiful Flowers and More Bountiful Vegetables! Use anywhere- In Ground and In Containers. Feeds for up to 4 months!